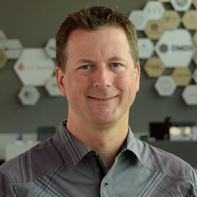 As Chief Technology Officer, Kevin McDunn develops and promotes a technology vision and roadmap to maximize the value of the UI LABS project portfolio. For over 20 years, Kevin has built winning products and businesses in strategy, product management, and engineering roles at Motorola, Google, and Lenovo. His core strength and passion is creating value at the intersection of customer insights and emerging technologies – creating entirely new lines of business, crafting top-rated mobile experiences, and launching products enjoyed by 100M+ consumers. Most recently Kevin was Global Head of Software, Services, and Experiences Product Management at Motorola Mobility, a Lenovo Company. He delivered experiences, software, and cloud services for Lenovo’s global smartphone and wearable portfolio. In this role, he managed teams in the U.S., China, Brazil, and India to develop experiences that respond to the user in context. Kevin has an International Masters in Management from Lancaster University (U.K.) and a B.S. in Mechanical Engineering from the University of Illinois. He is a Certified Scrum Product Owner and an accomplished inventor, holding 18 U.S. patents with 5 pending.